In my real life, I haven’t received an award in probably 15 years- maybe even longer (high school tennis is coming to mind). So how fun is it to find out that once you enter the blogosphere, people sometimes nominate you for cool stuff?! In the interest of paying that honor forward (and since they tend to entail kind of a slew of mentions and my blog is sort of streamlined at the moment), I wanted to create a separate page for that kind of thing. It’s all about spreading the love and sharing ideas. Hope that’s OK! The Bookshelf Gargoyle is just that- a small stone monstrous creature that sits on a bookshelf holding books up. However, he is crazy creative and his human friend Mad Martha writes these brilliant haiku book reviews. 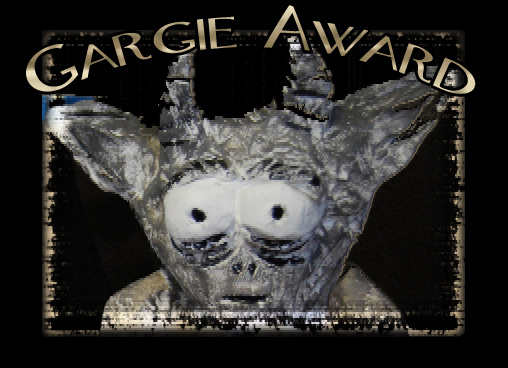 His other human friend Bruce nominated me for the very prestigious Gargie award, my first nomination, and I’m quite honored. Now I’m meant to nominate a fellow blogger, and I choose Vivienne, from Vivienne’s Process of Elimination. She’s a pole dancing teacher whose project is to slowly whittle away clutter from her house through her blog. She’s fascinating, and she’d appreciate the Gargoyle for his pure funkiness is my guess (and fortunately it’s just a notional item, not one more thing for her to purge). Nominate seven other bloggers for their own Beautiful Blogger Award, and comment on their blogs to let them know. Now seven seems like an awful lot, both interesting facts about myself and other nominations. Shall we compromise and say I’ll give you 3 interesting facts about myself and nominate 3 bloggers? Let’s. I may seem wholesome and charming, but I actually have a mouth like a trucker. I can not stand when words are spelled wrong for the purposes of alliteration, or worse, just for the fun of it. It’s not fun, people, it’s insufferable. My husband and I eloped almost 10 years ago in the Bay of Islands in New Zealand. Anne of A Decent Sparrow who is truly a genuine soul and lovely writer. Kara of Homeschooling Uncensored who opened my eyes to the world of urban homeschooling. Melissa of Julia’s Bookbag whose book and cool stuff blog I’m kind of obsessed with lately. I was nominated for a Very Inspiring Blogger Award by the waaaaaay-more inspiring A.M.B at The Misfortune of Knowing. Her blog covers “books, writing, and, when the mood strikes, law.” She delves deep into current issues, and it really is an inspiring blog. The terms of this nomination are pretty much the same as the Beautiful Blogger award. (4) Nominate and link to fellow bloggers. I love Tabasco sauce and put it on most everything. I am completely addicted to This American Life on NPR. I almost never turn down a glass of wine. Elephant’s Picture Book, a blog celebrating illustrations good and weird. Jill at Orange Marmalade. I would think it would be fascinating to sit with her and hear stories- she homeschooled 4 kids and lived in West Africa. Jeunesse at Little People on the Road. This blog is a true inspiration- it’s a travel blog written by a family sailing around the world with their two year old daughter. They’re currently posting up in Hawaii. 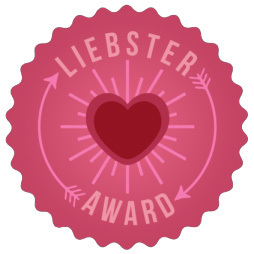 Elephant repaid me with this honor, the Liebster Award! It’s an award for new blogs with fewer than 200 followers. Hopefully I won’t be eligible for much longer. Right? Crickets… Anyhow, as I pointed out above, Elephant posts these really intense vintage fairy tale illustrations. Some are sweet, some are kind of creepy. Thank you, kind Elephant! The magic number with the Liebster is 11, and once again, my own magic number seems to be 3, so I’m asking myself 3 questions and sending the love to 3 more new bloggers. I think I’ll ask myself what 3 things I’ve learned in the move from a tropical island to an off-the-grid mountain cabin. When the battery in the headlamp is out, lights out. The gas lamp doesn’t cut it for bedtime reading. It takes 18 pumps of the hand pump to produce a gallon of water. The vegetable garden takes about 4 gallons a day. 800 square feet is all my family needs. Small=cozy=my happy place. Danzel at Silver Shoes and Rabbit Holes, a super fun bookworm who leans toward the vintage and funky. Caryn at Three Books a Night, an aspiring illustrator with really beautiful taste. Leanne at Vintage Books for the Very Young, with her self explanatory- and lovely- children’s book blog. Thank you so much for nominating my blog. What a honor! I’m not sure how this works. Do I display the badge on my site and nominated someone else now? This is new for me. Yup, that’s how it works I think. Here’s the original Gargie link. I dig your blog, Viv! Oh THANK YOU Amelie, your kindness really makes my day! I so appreciate having met you and your bloggy! Weehoooo! I’m so happy to spread the blog love! Thanks again Amelie! I love having blog friends.